Sew Can Do: Getting The Star Treatment This Week! Getting The Star Treatment This Week! 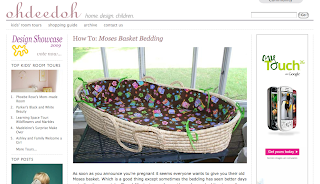 It seems my Moses Basket Tutorial is on a crafting tour this week! OhDeeDoh is featuring it today with a wonderful write-up. OhDeeDoh is THE place to find out about fun design stuff for kids, so I'm honored they asked to include my tutorial. Check out all the great finds they have - it's one of my fave places to peruse! Just out of curiosity, how does this moses basket design scale? Seems like it could be a great substitute for a hammock if you have no trees. This is so lovely, Congrats!! Thank you for your visit to my blog. I just received a hand-me-down moses basket w/ blue bedding and was thinking wouldn't it be great if I could change it to a more girl-friendly color? I wish I could sew!